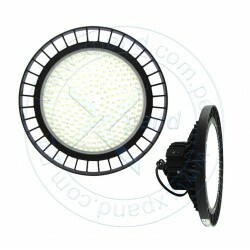 > Reflector LED High-Bay, 200W, 90-305 VAC, 24000 LM, 4000K. 50-60 VDC, 3.3A, 120 LM/W, 234 leds Nichida 3030. Reflector LED High-Bay, 200W, 90-305 VAC, 24000 LM, 4000K. 50-60 VDC, 3.3A, 120 LM/W, 234 leds Nichida 3030.